Working in collaboration with BRE, Carillion Energy Services and other key partners, the Northern Ireland Housing Executive (NIHE) is set to launch S-IMPLER, a new research and demonstration project designed to help the refurbishment sector achieve effective and economical retrofit of insulation in solid wall homes. Supported by the UK’s innovation agency, the Technology Strategy Board, the S-IMPLER Project, “Solid Wall Innovative Insulation and Monitoring Processes using Lean Energy Efficient Retrofit”, aims to achieve a 60% reduction in monitored energy costs of 1950s solid wall homes. The three year project will demonstrate how retrofit work can be carried out with less disruption and completed at least 10% faster compared to current solutions, with no impact on quality and safety. 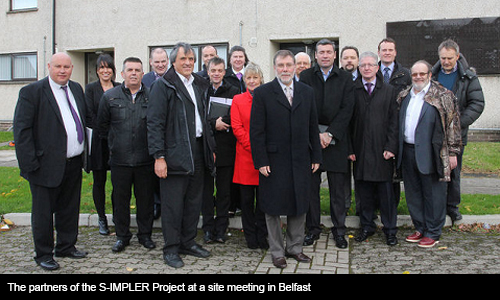 S-IMPLER will focus on the specific type of solid walls that form the 1950s ‘No-fines’ homes of which there are some 5,000 in Northern Ireland and 300,000 in the UK. Initially being trialled on seven NIHE homes, the outcomes of the project will have relevance for many of the UK’s 6.9m solid wall homes. Using lean and collaborative improvement techniques, led by Collaborative Improvement, S-IMPLER will integrate several innovations into a single attractive commercial proposition: an inventive surveying tool, led by VRM Technology, providing dwelling specific accurate details of labour and materials requirements across multiple green measures; a Building Information Modelling tool, led by the University of Salford, to allow clients to model different cost and benefit options; a whole house monitoring system, led by Tensor Systems, to assess real energy performance. In addition more detailed analysis of the fabric performance of the retrofitted homes will be conducted by Leeds Metropolitan University. Results from the project will be disseminated via events, and through S-IMPLER guides to specification, procurement and monitoring. In the coming months the project will seek suppliers and installers of energy efficiency products to be retrofitted into the seven homes. If you would like further information on this, please contact Jack Brayshaw; brayshawj@bre.co.uk.